REDDING, Calif. – Some graduates at Simpson University's spring commencement were the first in their family to earn a college degree. But Melissa (Lloyd) Olsen of Roseville had the distinction of becoming the 12th member of her family to receive a Simpson diploma. "I guess it just runs in the family," she said. On Saturday, along with 205 other graduates, Olsen earned a bachelor's degree in liberal studies with highest honors, from the same college that her mom, dad, two cousins, and several aunts and uncles attended. "It was fun to have the same professors as my parents did. On the first day of classes I went to my professors - Dr. Schaefer, Dr. Wallmark, and Professor Rose - and told them who my parents were. My parents were good students, so it wasn't a bad thing," she joked. Olsen's aunt, Becky (Lloyd) Lepper, first began the trend of attending Simpson in 1972. Since then, Olsen's family members have earned degrees in biblical literature, Christian education, psychology, cross-cultural studies, and biblical studies. Her cousin, Nathan Polk, is a junior in the ROTC program, majoring in history. Though several of her family members attended Simpson, Olsen hadn't planned to follow in their footsteps until she visited the Redding campus with her parents during an alumni appreciation weekend. "I think the reason I was hesitant to attend Simpson was because I didn't want to feel forced," she said. "But after I visited the campus and met professors, I fell in the love with it and knew I wanted to attend." Because Olsen didn't qualify for Cal Grant funding, she knew she needed some financial support in order to attend Simpson. Two days before her application was due, the university admissions counselor told her about the President's Scholarship, which would allow her to attend Simpson for half the tuition rate. After compiling a portfolio of community service activities, showing proof of having a high GPA, and submitting a paper on why she wanted to attend Simpson, she received news that she was a President's Scholarship recipient. 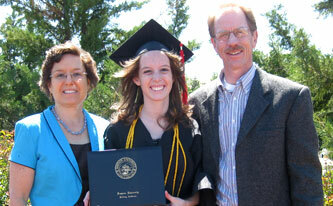 "Receiving the President's Scholarship was a huge blessing," she said. "Though my parents were able to provide some financial help, I don't think I would have been able to attend without this." Olsen's mother, Lisa (Woodward) Lloyd, who met her husband while attending Simpson College at the San Francisco campus, said that Simpson is more than just a place where she and other family members earned their degrees. "Simpson has provided us with much more than just an education," she said. "It was a place where we grew spiritually. Watching Melissa graduate this weekend was really special because my husband and I returned to our alma mater." Simpson proved to be a good support network when Olsen's cousin was diagnosed with cancer. Monica (Lepper) Rodriguez, who graduated in 1998 with a degree in liberal studies, was diagnosed with a rare form of cancer from which she later passed away. "The way that Simpson rallied around my cousin as she went through her battle against cancer was truly amazing," she said. "Seeing Professor Pam Van der Werff post a picture of Monica in her office, shed tears over her, and ask me how she was doing, was a lovely form of encouragement, and it truly represents the love and community that Simpson has given my family." While at Simpson, Olsen became involved in several student activities. She participated on the social action committee, served as a prayer leader in the dorms, played soccer for two years, and traveled to Uganda on a missions trip in 2008. Olsen has completed the teaching credential courses and will begin student teaching in August. She hopes to be credentialed by January 2012. When asked who the next person in her family will be to enroll in Simpson, Olsen said, "We might need to wait for the next generation. I hope many more of my family members get to experience such a wonderful place for higher education."